A fabulous and highly specified beachfront villa of sumptuous contemporary design. Child-friendly, with beautiful sunset sea views. Amenities satellite LCD TVs, DVD/CD players, iPod docks, WiFi broadband internet, fully air-con, fully equipped kitchen, BBQ, kids' pool and playroom, fitness accessories, 2 metre projector screen, sea kayaks and paddle board. Baan Kilee is a stunning contemporary designed villa located on the sunset-facing west coast, overlooking the scenic Five Islands. With 30 metres of frontage onto a powder sand beach, this fabulous home is generously proportioned, highly specified, and beautifully furnished. The walled and gated property is child-friendly, with dedicated kids’ pool, playroom, and playground at the rear of the villa. Immensely proportioned, the villa combines luxurious comfort with intimate appeal, and is both child-friendly and perfect for entertaining, with multiple lounge areas. The huge swimming pool is separated from the white powder sand beach by a grass lawn. The infinity-edge pool blends into the sea view, and features a swim-up bar with movie projector system adjacent to the sunken BBQ pit. The pool is surrounded by a large sandstone deck that is well furnished with sun-loungers and parasols. The impressive double kitchen includes a full-time chef, and features a floor to ceiling glass wall onto the garden. A large breakfast bar island is complemented by an adjoining casual dining room with comfortable low-level seating. In a self-contained glass-walled pavilion, the air-conditioned cinema room is equipped with a 2 metre projector system with surround sound, and deep, low, cushioned sofas. A large DVD library is available for viewing. The large main living area includes 2 suspended double daybeds, and a sumptuous formal dining table seating 18. Baan Kilee accommodates up to 12 adults and 8 children, with 2 additional cots available for infants. The master bedroom is located above the dining and living room, and includes a large balcony facing the sea view and pool. With vaulted ceilings and polished wooden floors, the master bedroom has a lounge area, and separate sleeping area with twin beds for children in addition to the King-size double bed. The large en-suite bathroom includes a tub and walk-in rain shower. On either side of the main building are 2 large twin bedrooms, each with loft bedrooms accessed by retractable ladder stairs, which are ideal for older children. Both bedrooms have high vaulted ceilings, sea views, and are bright and airy. The twin beds can be converted into seamless King-size doubles with thick mattress toppers. The sleeping lofts are located above the en-suite bathrooms with tubs and rain showers at the rear of the bedrooms. The two additional bedrooms are doubles in separate pavilions with sea and pool views, and opening onto the internal garden. Both bedrooms have private en-suite bathrooms with rain-showers and bath tubs. The bedroom closest to the beach also includes 2 small single beds suitable for children. All 5 main bedrooms are air-conditioned, with ceiling fans and satellite LCD TVs with DVD players, and i-pod docks. At the rear of the property is a grass lawn garden area with an impressive entrance. A children’s paddling pool and climbing frame with slide are located outside the air-conditioned playroom that is equipped with a wide range of toys in storage baskets, as well as twin beds and en-suite bathroom. The playroom can be set up as a light exercise room when not in use by kids, with yoga mats, small weights, pilates balls, and Muay Thai boxing sack and gloves. Lawn croquet, boules, stand up paddle board, and sea kayaks are available for guests' use. 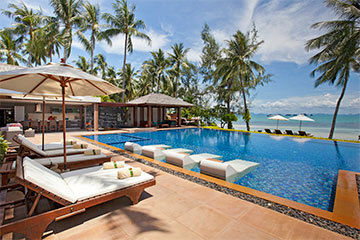 Baan Kilee has a full team of dedicated staff available to cater to your every whim, lead by a multi-lingual manager. 8 bedrooms, sleeping up to 12 adults + 6 children. 6 bedrooms, sleeping up to 10 adults + 6 children. 5 bedrooms, sleeping up to 10 adults + 4 children. -Rates are specified in USD, exclusive of 10% service, and 7% tax. -At full occupancy, if more than 12 guests are adults over the age of 12, a surcharge of $50++ USD applies to each additional adult.